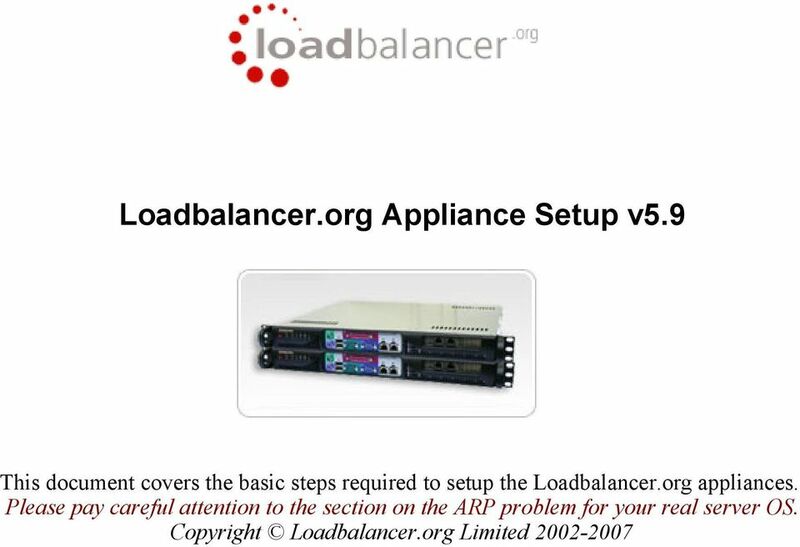 Download "Loadbalancer.org Appliance Setup v5.9"
3 Planing Setting up a load balancer from Loadbalancer.org is easy, but a little planing never hurt anyone. Deciding on your objectives is always the first step, are you looking for increased performance, reliability, ease of maintenance or all three? Performance Reliability Maintenance A load balancer can increase performance by allowing you to utilize several cheap servers to do the work of one web site. Running a web site on one server gives you a single point of failure, utilizing a load balancer moves the point of failure to the load balancer. At Loadbalancer.org we advise that you only deploy load balancers as clustered pairs for this very reason. 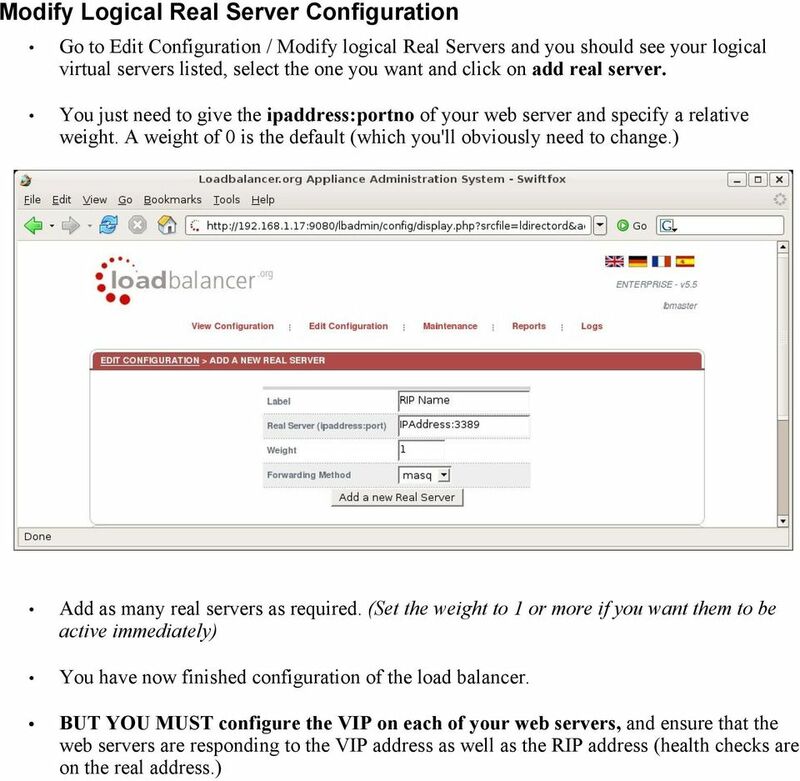 Using the load balancer you can easily bring servers on and off line to perform maintenance on individual web servers. 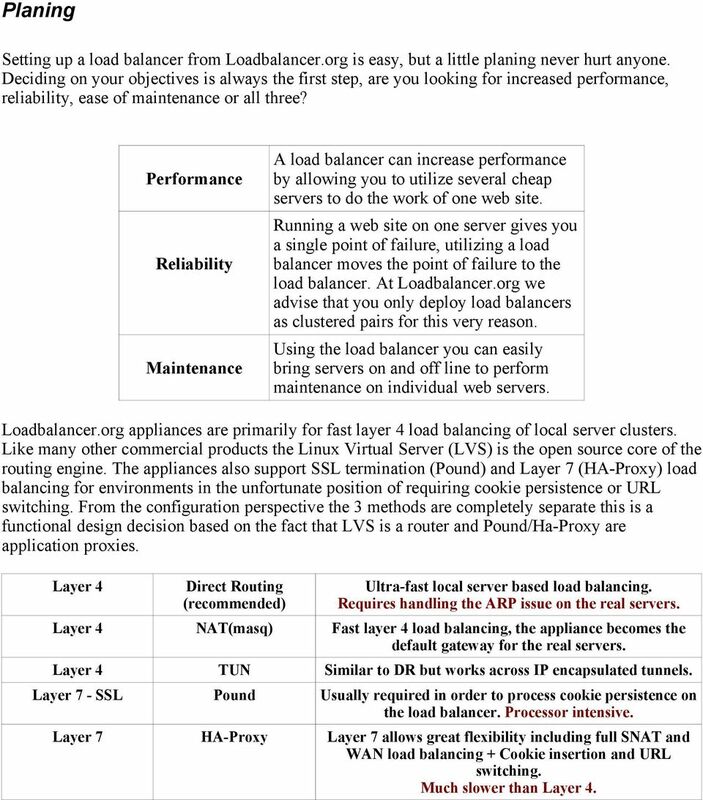 Loadbalancer.org appliances are primarily for fast layer 4 load balancing of local server clusters. Like many other commercial products the Linux Virtual Server (LVS) is the open source core of the routing engine. The appliances also support SSL termination (Pound) and Layer 7 (HA-Proxy) load balancing for environments in the unfortunate position of requiring cookie persistence or URL switching. From the configuration perspective the 3 methods are completely separate this is a functional design decision based on the fact that LVS is a router and Pound/Ha-Proxy are application proxies. Layer 4 Direct Routing (recommended) Ultra-fast local server based load balancing. Requires handling the ARP issue on the real servers. 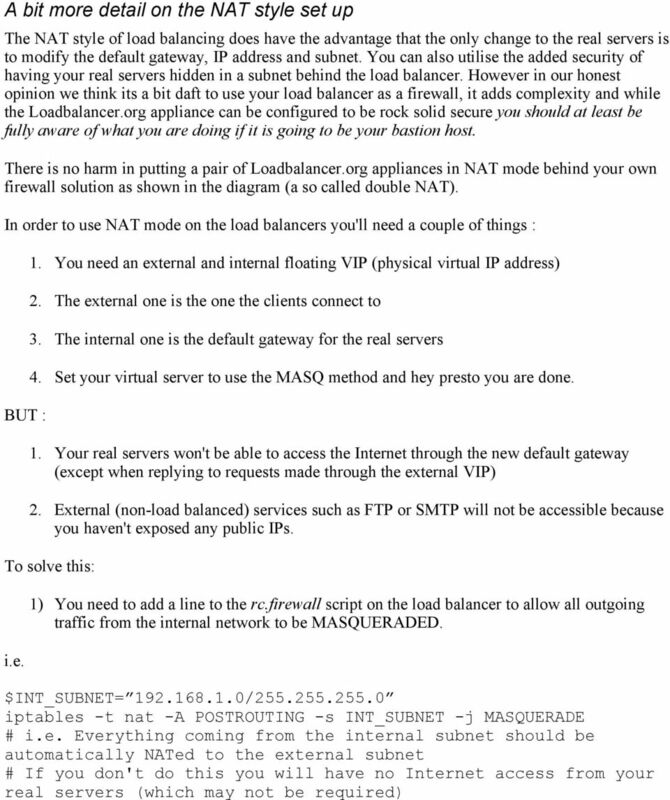 Layer 4 NAT(masq) Fast layer 4 load balancing, the appliance becomes the default gateway for the real servers. Layer 4 TUN Similar to DR but works across IP encapsulated tunnels. Layer 7 - SSL Pound Usually required in order to process cookie persistence on the load balancer. Processor intensive. Layer 7 HA-Proxy Layer 7 allows great flexibility including full SNAT and WAN load balancing + Cookie insertion and URL switching. Much slower than Layer 4. 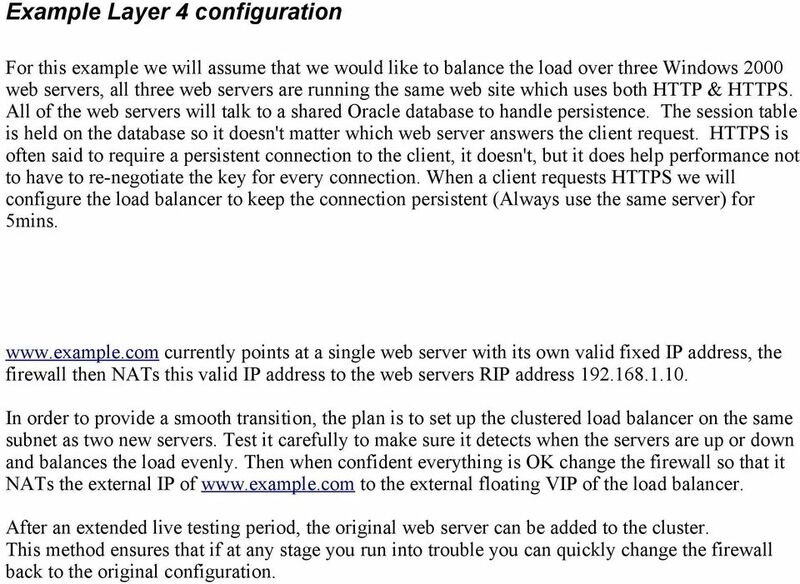 4 Example Layer 4 configuration For this example we will assume that we would like to balance the load over three Windows 2000 web servers, all three web servers are running the same web site which uses both HTTP & HTTPS. All of the web servers will talk to a shared Oracle database to handle persistence. The session table is held on the database so it doesn't matter which web server answers the client request. HTTPS is often said to require a persistent connection to the client, it doesn't, but it does help performance not to have to re-negotiate the key for every connection. When a client requests HTTPS we will configure the load balancer to keep the connection persistent (Always use the same server) for 5mins. currently points at a single web server with its own valid fixed IP address, the firewall then NATs this valid IP address to the web servers RIP address In order to provide a smooth transition, the plan is to set up the clustered load balancer on the same subnet as two new servers. Test it carefully to make sure it detects when the servers are up or down and balances the load evenly. Then when confident everything is OK change the firewall so that it NATs the external IP of to the external floating VIP of the load balancer. After an extended live testing period, the original web server can be added to the cluster. This method ensures that if at any stage you run into trouble you can quickly change the firewall back to the original configuration. 5 Refining the planing Now step back and review the plan. Load balancers only work effectively if the web servers are completely stateless, do your web servers store persistent information on local drives? Images (jpeg,png,gif etc.) Files (html,php,asp etc.) Session data (Standard ASP and PHP session data is stored locally by default!) 1) Your session data MUST be stored on a shared database Postgres, Oracle, MSSQL etc. 2) Your content either needs to be on shared storage, or replicated between each web server. On UNIX you can use the RSYNC command to replicate files, on Win2K you need ROBOCOPY from the NT resource kit. Usually you will FTP your content to one master server and then replicate it from there to the others. Now is also a great time to document the disaster recovery process for your web site, after all you do need to build two new web servers. What do you do if your application is not stateless? Re-write it! Seriously that's the best option, but if not don't worry just use persistence, you'll loose your fail over but you'll still get increased capacity. This problem occurs with all load balancers what ever the technology used to get around it. Persistence Methods The basic layer 4 persistence method is source IP persistence, you can handle millions of persistent connections at layer 4. NB. If you need to group HTTP & HTTPS as a persistent group you will need to use Firewall Marks (see the administration manual). What about the AOL mega proxy problem? You can change the persistence subnet mask to a lower granularity (which may help) or switch to layer 7 cookie based methods. NB. Obviously this won't work for any clients that don't accept cookies. Did we mention that you can't have fail over if you don't have persistence built into your application! 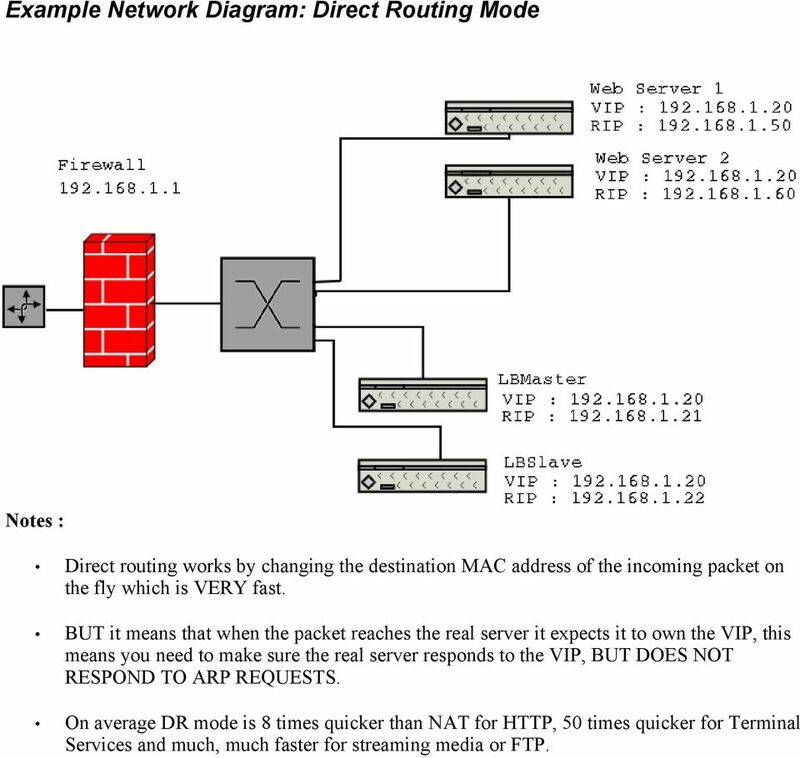 7 Example Network Diagram: Direct Routing Mode Notes : Direct routing works by changing the destination MAC address of the incoming packet on the fly which is VERY fast. BUT it means that when the packet reaches the real server it expects it to own the VIP, this means you need to make sure the real server responds to the VIP, BUT DOES NOT RESPOND TO ARP REQUESTS. On average DR mode is 8 times quicker than NAT for HTTP, 50 times quicker for Terminal Services and much, much faster for streaming media or FTP. 8 Example Network Diagram: Network Address Translation Mode Notes : The Loadbalancer.org appliance can work in Dual NIC NAT mode by default. Just set up your VIP with a default mode of MASQ instead of GATE. All the internal NAT will be handled automatically for balanced services on the VIP. BUT you will need to set up two Physical Virtual IP addresses (one for the internal floating IP, and one for the external floating VIP.) Your real servers will need their default gateway changed to the internal floating IP address. If you want the real servers to be able to access the Internet on their own i.e. Browse the web you will need to set up a MASQ rule in the firewall script. If you want real servers to be accessible on their own IP address for non-load balanced services i.e. SMTP you will need to set up individual SNAT and DNAT firewall script rules for each real server. You can also do Single NIC NAT in exactly the same way, but instead of using a second NIC just set up an alias for the second network in your firewall script. NB. When doing single NAT make sure you disable redirects in the rc.firewall script an example is given in the default script. Because of these issues (which are common to all load balancers) we recommend that you use the default Direct Routing Set up when it is possible. 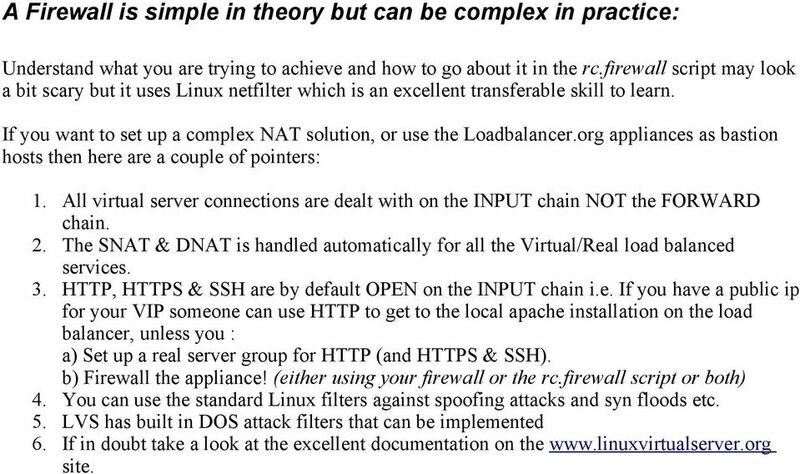 11 A Firewall is simple in theory but can be complex in practice: Understand what you are trying to achieve and how to go about it in the rc.firewall script may look a bit scary but it uses Linux netfilter which is an excellent transferable skill to learn. If you want to set up a complex NAT solution, or use the Loadbalancer.org appliances as bastion hosts then here are a couple of pointers: 1. All virtual server connections are dealt with on the INPUT chain NOT the FORWARD chain. 2. The SNAT & DNAT is handled automatically for all the Virtual/Real load balanced services. 3. HTTP, HTTPS & SSH are by default OPEN on the INPUT chain i.e. If you have a public ip for your VIP someone can use HTTP to get to the local apache installation on the load balancer, unless you : a) Set up a real server group for HTTP (and HTTPS & SSH). b) Firewall the appliance! (either using your firewall or the rc.firewall script or both) 4. You can use the standard Linux filters against spoofing attacks and syn floods etc. 5. LVS has built in DOS attack filters that can be implemented 6. If in doubt take a look at the excellent documentation on the site. 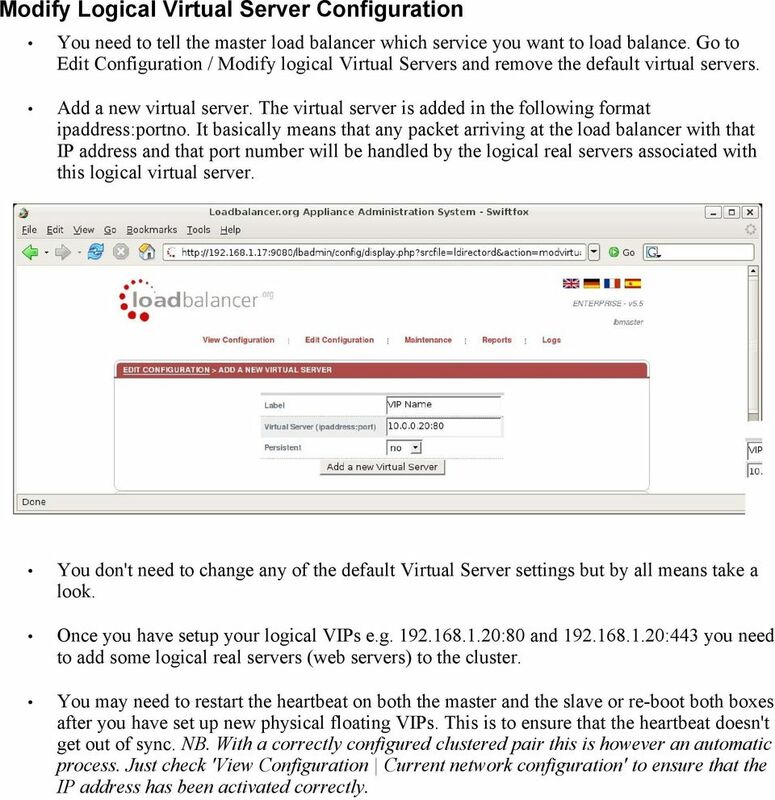 14 Modify Logical Virtual Server Configuration You need to tell the master load balancer which service you want to load balance. Go to Edit Configuration / Modify logical Virtual Servers and remove the default virtual servers. Add a new virtual server. The virtual server is added in the following format ipaddress:portno. It basically means that any packet arriving at the load balancer with that IP address and that port number will be handled by the logical real servers associated with this logical virtual server. You don't need to change any of the default Virtual Server settings but by all means take a look. Once you have setup your logical VIPs e.g :80 and :443 you need to add some logical real servers (web servers) to the cluster. You may need to restart the heartbeat on both the master and the slave or re-boot both boxes after you have set up new physical floating VIPs. This is to ensure that the heartbeat doesn't get out of sync. NB. With a correctly configured clustered pair this is however an automatic process. Just check 'View Configuration Current network configuration' to ensure that the IP address has been activated correctly. 16 Solving the ARP problem (Direct Routing method only) Each web server needs a loop back IP address to be configured as the VIP This address needs to be stopped from responding to ARP requests and the web server needs to be configured to respond to this IP address. Why? It is important the your web servers do not fight with the load balancer for control of the shared VIP. If they do then request will be sent directly to the web servers rather than hitting the load balancer VIP as intended. NB. You only need to resolve the ARP issue on the real servers when you are using the default DR (Direct Routing) load balancing method or IPIP (TUN or IP encapsulation). 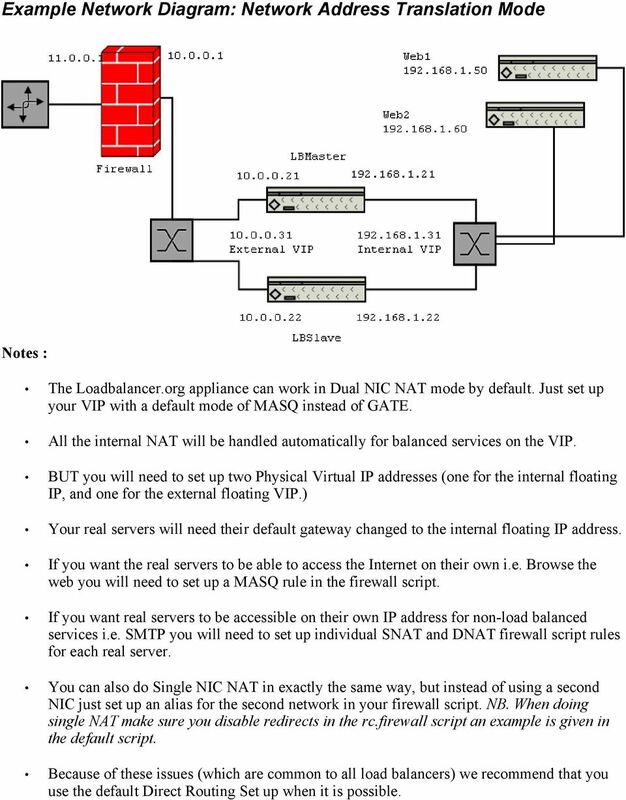 If you are using NAT mode you don't need to make any changes to the real servers except to make sure the load balancers internal floating IP address needs to be set as the default gateway. 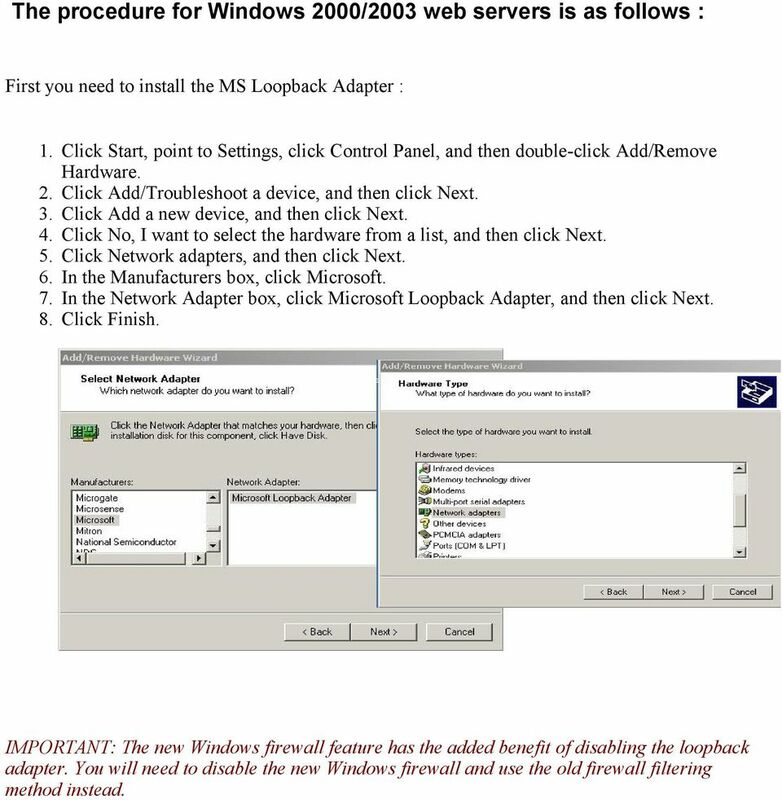 17 The procedure for Windows 2000/2003 web servers is as follows : First you need to install the MS Loopback Adapter : 1. Click Start, point to Settings, click Control Panel, and then double-click Add/Remove Hardware. 2. Click Add/Troubleshoot a device, and then click Next. 3. Click Add a new device, and then click Next. 4. Click No, I want to select the hardware from a list, and then click Next. 5. Click Network adapters, and then click Next. 6. In the Manufacturers box, click Microsoft. 7. In the Network Adapter box, click Microsoft Loopback Adapter, and then click Next. 8. Click Finish. IMPORTANT: The new Windows firewall feature has the added benefit of disabling the loopback adapter. You will need to disable the new Windows firewall and use the old firewall filtering method instead. 19 7. 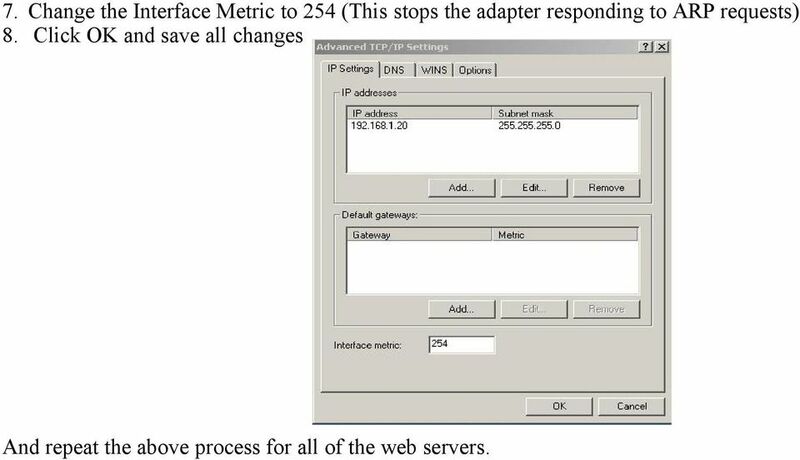 Change the Interface Metric to 254 (This stops the adapter responding to ARP requests) 8. Click OK and save all changes And repeat the above process for all of the web servers. 20 The procedure for Linux... Ironically Linux is a pain because the lo interface responds to ARP requests by default! Use one of the following two methods to get around this: Transparent Proxy (Horms method) You can side step the issue for both by using iptables on the real server to re-direct incoming packets destined for the VIP. This is a simple case of adding the following command to your rc.firewall script : iptables -t nat -A PREROUTING -p tcp -d VIP -j REDIRECT i.e. Redirect any incoming packets destined for (the VIP) to my local address. If you have multiple virtual servers defined by ip address you will need to be more specific and use a similar command to this instead: iptables -t nat -A PREROUTING -d VIP -p tcp -m tcp --dport 80 -j DNAT --todestination RIP:80 NB. You don't need to configure a loopback adapter when using Horms method. 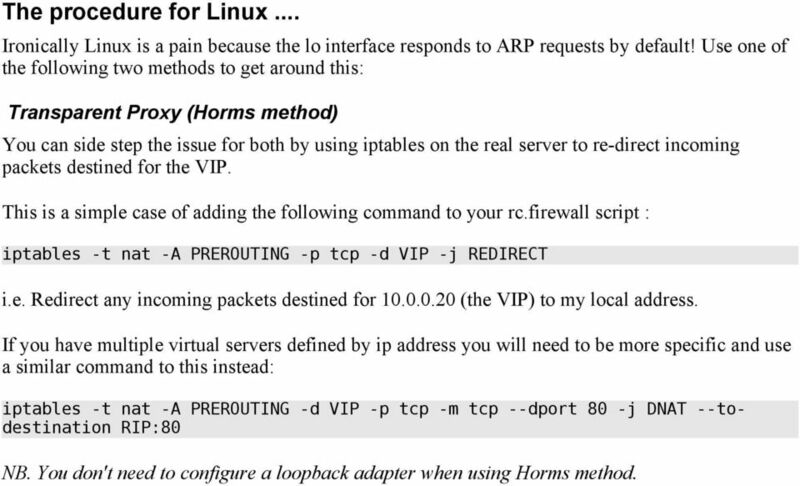 22 The procedure for Solaris... Solaris is nice and easy, the loopback interface does not respond to ARP requests so you just add your VIPs to it. ifconfig lo0:1 plumb ifconfig lo0:1 VIP netmask up You will need add this to your start up scripts for your server. The procedure for Mac OS X & BSD... OS X is BSDish, so you need to use BSDish syntax: ifconfig lo0 alias VIP netmask arp up You will need add this to your start up scripts for your server. 23 Testing For testing add a page to each real web servers root directory i.e. Test.html and put the server name on this page. Now you need a couple of clients to do the testing, Open up a web browser on two different clients and enter the URL for the VIP i.e Each client should see a different server name because of the load balancing algorithm in use. Why two test clients? If you use a single client it will most likely keep on hitting the same server for multiple requests this is to do with the way the TCP protocol works. Pull the Network cable out of one of the web servers, wait 6 seconds (for the load balancer to detect the change) and then refresh the browsers on both clients, they should both now switch to the same server (as one has been removed from the load balancing list). Put the Network cable back in to the web server, wait 6 seconds and then refresh the browsers again, they should now show different web servers again. NB. If you want to test the fail over of the actual load balancers make sure you power one of the boxes down DONT JUST PULL THE SERIAL CABLE OUT! This will cause big problems... You can configure fail over on network failure but it is not enabled by default. Also be careful of your ARP cache (arp -a) make sure it is empty on the client before testing fail over. If you are having any kind of difficulty at all 'arp -a' is your friend. 24 Example Layer 7 configuration For this example we are going to assume that the e-commerce application does not support persistence. We are going to decrypt the SSL traffic on the load balancer insert or read the session cookies as required and pass the traffic the the real servers in plain unencrypted HTTP. 1. The Firewall will translate all traffic for the web sites public IP address the the load balancers floating VIP ( ). 2. The load balancer (Pound) will terminate SSL traffic to :443 and re-direct it to :80 using a valid uploaded SSL certificate. 3. The load balancer (Ha-Proxy) will handle cookie insertion/reading on all traffic through :80 and ensure each client goes to the correct server. Example Network Diagram: Layer 7 Proxy mode The network diagram for the Layer 7 Ha-Proxy mode is very similar to the Direct Routing example except that no re-configuration of the real servers is required. The load balancer proxies the application traffic to the servers so that the source of all traffic becomes the load balancer. NB. You can configure your web server logs to parse the X-Forwarded-For header to find the client source IP. 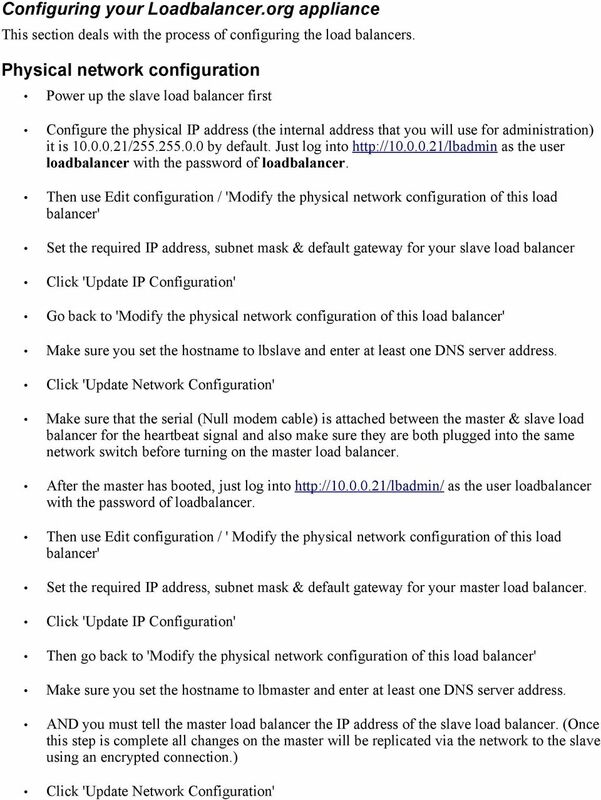 25 Configuring your Loadbalancer.org appliance Follow the previous configuration instruction to set up your load balancer or clustered pair with a physical IP address. IMPORTANT: The load balancer administration interface uses port 80 & 443 by default this will need to be changed before implementing a proxy on those ports. From the local console, or the remote console via SSH or Putty login as root and: Type the command: lbhiports This will modify the local Apache server to respond to ports 9080 and 9443 respectively for the administration interface. You can also do this from the web interface: IMPORTANT: If you do this from the web interface the script will NOT be able to restart the Apache process. A cron job will realize the server is dead and restart it but this may take up to 7 minutes. From the web based administration interface go to Edit Configuration > Execute shell command Type the command: lbhiports Then hit the 'Execute command' button. The web browser should then fail to connect (as the ports have changed). Modify your browsers URL to use port 9080 or 9443 respectively i.e. 26 Modify logical Virtual Servers (Layer 7 HAProxy) You need to tell the master load balancer which service you want to load balance. Go to Edit Configuration > Modify logical Virtual Servers (Layer 7 HAProxy). Add a new virtual server. The virtual server is added in the following format ipaddress:portno. It basically means that any packet arriving at the load balancer with that IP address and that port number will be handled by the logical real servers associated with this logical virtual server. Configure the Virtual Sever as :80 Set persistence to 'Yes'. Set Mode to 'http' Set the Fallback server as required, this is where requests go if all servers in the cluster are down. Click the button to add the new Virtual Server to the Ha-Proxy configuration file. You will see the following message: will be added as an alias to eth0. NB. You may need to restart heartbeat for this change to take effect. This is the floating VIP being added, you only need to restart heartbeat if you have a single unit configured. Clustered pairs can bring up the VIP immediately. 27 Modify Logical Real Server Configuration (Layer 7 HAProxy) Go to Edit Configuration > Modify logical Real Servers (Layer 7 HAProxy) and you should see your logical virtual servers listed, select the one you want and click on add real server. You just need to give the ipaddress:portno of your web server and specify a relative weight. Add as many real servers as required. (Set the weight to 1 or more if you want them to be active immediately) You have now finished configuration of the load balancer. IMPORTANT: The Label is used as the cookie so make sure it is different for each server. IMPORTANT: You must restart the Ha-Proxy service in order to activate the changes i.e. Edit Configuration > Restart HAProxy. 28 Modify logical Virtual Servers (SSL Termination Pound) In order to set up a proxy for the SSL traffic go to Edit Configuration > (SSL Termination Pound). It is common for SSL traffic to be terminated and then re-directed to port 80 of the same VIP for HAProxy to pick it up insert cookies and load balance it. Add a new Virtual Server Configure the Virtual Server as :443 Configure the Backend as :80 Click the button to add the new Virtual Server to the Pound configuration file. IMPORTANT: You must restart the Pound service in order to activate the changes i.e. Edit Configuration > Restart Pound-SSL By default a self generated SSL certificate is associated with the new Virtual Server. You can upload your valid certificate by selecting modify for the Virtual Server. Just browse your local machine for the cert.pem file and click the upload button.